Learn the causes and signs of breast cancer in both young women and mature women with this overview that outlines preventative measures and treatment. Signs of breast cancer may vary in different women, but the disease does yield some common symptoms. Before delving into the signs of breast cancer, however, it's important to identify what makes this form of cancer stand out. Breast cancer is a type of cancer that occurs when a malignant tumor forms from cells within the breast. It occurs most frequently in women, but men can and do develop breast cancer, though much less frequently. The American Cancer Society estimates that 1 in every 8 women will develop breast cancer in their lifetime, making it the most common cancer among women, aside from skin cancer. Family Planning Choices. Women who choose not to have children or have them after age 30 somewhat increase their risk of breast cancer. Genetics. Genetics may play a role in up to 10 percent of women diagnosed with breast cancer. Hereditary breast cancer occurs when a mutated gene has been passed down from a parent. The most common genetic mutation is that of the BRCA gene pair, referred to as "BRCA1" and "BRCA2". These genes are responsible for regulating cell growth and repairing damaged DNA but do not properly function if mutated. Those who are found through genetic testing to be carriers of mutated BRCA genes are at an increased risk of developing breast cancer. Other gene types have been associated with breast cancer but not as prevalently as the BRCA genes. Age: As we grow older, our risk of developing breast cancer increases. It is estimated that 80 percent of women diagnosed with breast cancer are 50 or older. This doesn't mean that younger women aren't at risk. Young women are diagnosed with breast cancer, just much less frequently.Family and Personal History of Breast Cancer. Having a mother, sister or daughter with breast cancer doubles your risk of the disease. While family history can play a role in breast cancer development, women shouldn't subscribe to the popular belief that those without a family history of breast cancer aren't at risk. The American Cancer Society estimates that 70 to 80 percent of women with breast cancer do not have a family history that includes breast cancer. Women who have previously been diagnosed and treated for breast cancer are at a greater risk of developing breast cancer again. Race. Of all women, Caucasian women are diagnosed more frequently than women of other races. Although Caucasian women are the most at risk, African American women die of the disease most frequently. Asian, Native American and Hispanic women have a lower risk. Alcohol Consumption. Women who drink alcohol increase their breast cancer risk and the risk is heightened with the amount of alcohol consumed. Women who drink two to five drinks a day increase their risk 1.5 times compared to women who do not drink alcohol. One drink a day only slightly elevates a woman's risk. Other breast cancer risk factors include the use of hormone replacement therapy, obesity, and oral contraceptive use. While some symptoms of breast cancer can be seen or touched, there are instances in early breast cancer where no symptoms can be detected by physical examination. Imaging tests like mammograms and MRI can detect breast abnormalities that cannot be seen or felt. Regular breast cancer screenings can reveal breast abnormalities that require additional testing. Some women detect breast abnormalities through breast self-exams at home or through a clinical breast exam by their doctor. Most breast abnormalities are found through mammography. Only 10 percent of symptoms are initially found through a physical exam. The remaining 90 percent are detected through mammograms, proving just how vital it is to have regular mammograms. 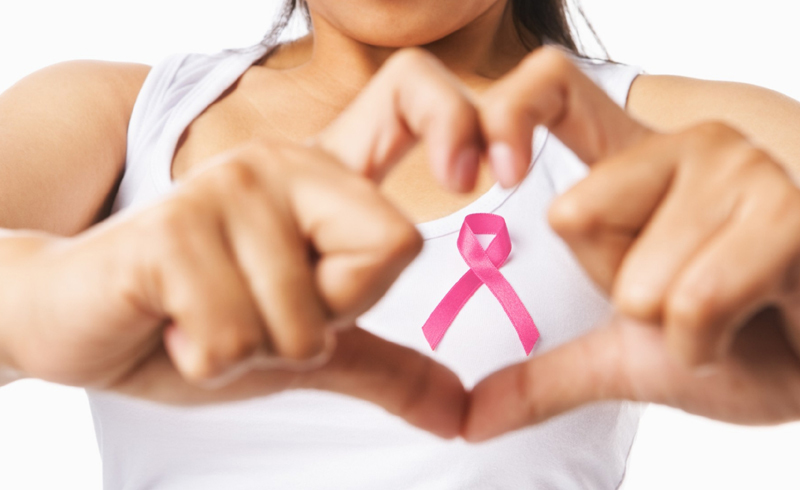 The American Cancer Society recommends that women begin having annual mammograms at age 40. Women who are at higher risk of developing breast cancer may begin screenings earlier. When mammograms reveal an abnormality, further testing is done to determine if breast cancer is present and what stage the disease is in. A breast biopsy may be done. This involves the doctor removing a small amount of breast tissue to be studied under a microscope.